With subscripts you can quickly access the member elements of collections. It’s a powerful feature of the Swift programming language. In this article, you’ll learn how to use subscript syntax and how to define your own custom subscripts. The above dictionary scores has keys of type String and values of type Int. You could say that it associates person names with a score, i.e. Arthur has scored 42 points. You can now refer to any of the members in this collection by using subscript syntax. The scores["arthur"] part is called subscript syntax. It’s the Swift syntax you need to access member elements of the scores dictionary. By default, you can use subscripts with arrays, dictionaries, collections, lists and sequences. You can also implement your own with the subscript function, as you’ll see later on. 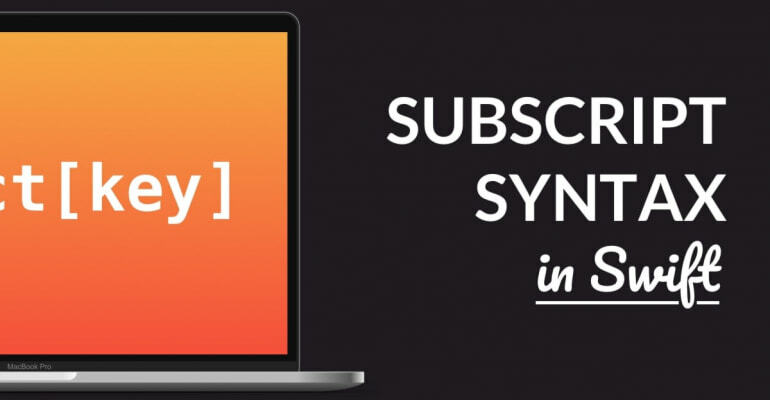 Subscripting isn’t limited to a single dimension, which means you can use them for multi-dimensional arrays and dictionaries too. If you’re unfamiliar with arrays, it’s worth reading up on them. Keep in mind that the arrays are zero-indexed, so they start at index number 0. Subscripts are useful in a great number of scenarios, especially because they make your code concise and easy to read. Consider the Address Book below. Imagine it’s full of names and addresses. "phone": "+1 1234 56 7890"
That’s expressive — get the member with key "Arthur Dent", then get its address with key ["address"], and then get the value of key "street". It’s important to understand here that the first subscript essentially gets the entire contact entry, and the second gets the "address" collection from that complete entry, and the third gets the String value with the streetname. You can see it as branches on a tree, if you “rotate” the collection counter-clockwise. Every [...] refers to a branch, until you get to the “leaf”, i.e. the value you’re looking for. In the above code we’re defining an array with digits of the number Pi (3.1415). The for loop iterates over a range from 0 to the end of the array, with 0..<pi.count. On the first line of the for loop, pi[index] is used to access a member of the pi array with a given index number. Because of the loop, this index corresponds to every possible index number in the pi array. Imagine we’re building a database system, that uses some kind of on-disk saving method. You want to access this database like any other collection, so you define the above subscript function. A real-world example can be found in the source code of Realm, a database platform. If you scroll down (or search) in Results.swift, you can see the subscript and how it returns an object of type Element from rlmResults. Because of this, you can use Results[index] in your own Swift project. What’s even more interesting is that any class can define a subscript, even if that class isn’t a typical collection. In that sense, the subscript syntax just calls a function. Hmm, that’s interesting! Even though the Count class isn’t a collection, you can use it like a collection by accessing any key with subscript syntax. The Int index is just used as the input for the subscript function, which returns a string based on the number by using a switch block. Amazing! In essence, subscripts are just syntactic sugar to access members of collections. It’s quite powerful though, and concise, and it’s always a great idea to dive a little deeper into such syntactic niceties. After all, you learn a great deal about Swift programming this way. If you’re up for a challenge, check out Playing With Code: Insertion Sort In Swift. The implementation of the insertion sort relies on subscripts to get the right values from the sorting array – so it’s good practice to get the hang of how subscripts and arrays work.